BRYAN JACKSON is an award winning director and writer based in Los Angeles. He’s currently working on his first feature The Rockwell Boys. His earlier short films take a unique approach to narrative storytelling, and draw upon his background in theater, experimental film and video. Originally from Kansas, he studied Art and Theater at Emporia State University, exhibited photography, designed stage productions, discovered the films of Derek Jarman, and engaged in activism, establishing the Gay Lesbian Alliance for Resource and Education. After a summer at the innovative Glimmerglass Opera working on productions with Mark Lamos, Jonathan Miller, and Martha Clarke, he realized he saw storytelling through the mind of a director and completed his BFA with a new focus on directing. After a stint on the east coast working in regional theater, opera and broadway productions, he attended graduate school at the University of California, Los Angeles. At UCLA he staged works by Jean Genet, e.e. cummings, and Naomi Wallace and made his film festival premiere at Outfest with a haunting re-editing of the Disney film Smoke (1999). Showers (2001) is told through fragments of dialogue and a rhythmic montage of city life, following a man from bed-to-bed and shower-to-shower. The film marked his first collaboration with Japanese composer Yoshizawa Eiji. 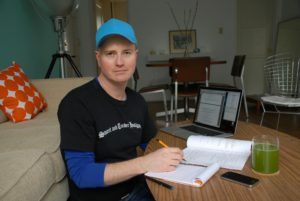 After earning his MFA in Directing, Jackson produced video installations that were used as the setting for two new operas, Orlando and Consumer’s Paradise, in the premiere of Long Beach Opera’s Downtown Opera Project. Haircut (2004) was shot entirely in first-person with a surveillance camera mounted to the forehead of the protagonist and features James Kyson Lee (Heroes). The film won the Jury Prize for Best Experimental Film at New Orleans’ Reel Identity Film Festival, and was named Best Experimental Short at Cinekink New York. Haircut screened as an official selection at over 45 international film festivals. In 2006, he co-produced video installations for LACMA Lab’s ‘Consider This…’ with artist Bruce Yonemoto. Softly (2007) is a Douglas Sirk-styled, biographical film that blurs the line between dollhouse and reality–creating a world as fragile and ephemeral as the romance story that takes place within the frame. The film employs Bratz Boyz dolls as actors staged on miniature, handcrafted sets and features music by Yoshizawa Eiji. Roberta Smith in the New York Times stated “… (Softly) has a wonderful noirish feeling.” Josh Wolin in Time Out New York called it “…preposterously campy and strangely affecting” and it was selected as the “Time Out Pick of the Week.” The film utilizes neutral mask technique where the unchanging face of the doll is manipulated with light, shadow and gesture to create emotions in the viewer’s mind. Gaze (2008) was created for the LA Fashion Awards continues using the same techniques, and was the first in a series of short atmospheric videos for l.a.Eyeworks. Little Taiko Boy (2010) combines Western holiday traditions, Shinto mythology and Japanese gay culture in a humorous, sensuous response to dealing with the high transmission rate of HIV/AIDS in the Japanese MSM communities. The film was developed in collaboration with activists from the Community Center AKTA in Tokyo and was shot on the streets of Tokyo and on built sets in Southern California. It was funded in-part by a grant from Art Matters. Jackson has taught acting and directing at UCLA, and filmmaking at the Southern California Institute of Architecture (SCI-Arc), and the San Francisco Art Institute. Currently he teaches in the Digital Filmmaking program at the University of California, Irvine.